The latitude of 30° South is the magic latitude on Earth for seeing the Milky Way. From that region of the world – southern Australia, central South America, southern Africa – the centre of the Galaxy passes overhead, and you see the view at top. You see the galactic core glowing brightly at the zenith, and the arms of the Milky Way stretching off to the horizon on either side of the core – to Aquila at left, for the northern half of the Galaxy, and to Carina at right, for the southern half of the Galaxy. That area of the Galaxy is always below the horizon for viewers at northern latitudes. 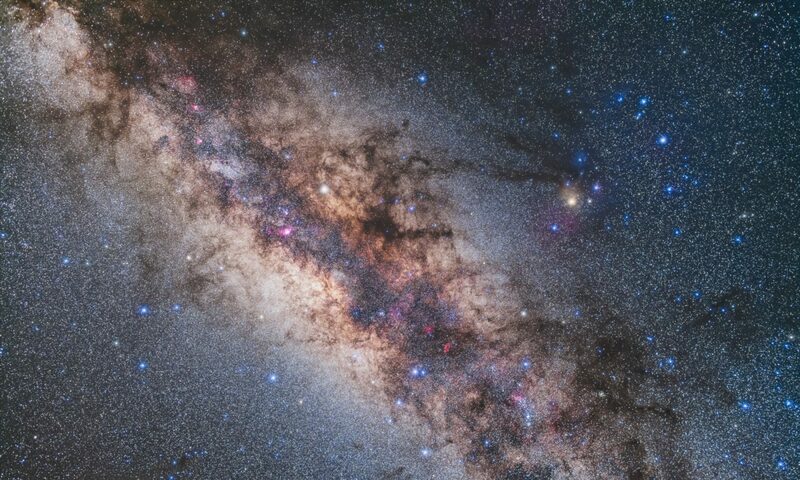 The image below focuses in on just the southern portion of the Milky Way, framing what in Australia is called the “Dark Emu,” a constellation made of the dark lanes along the Milky Way, from his head at right in Crux, to his tail at left in Scutum. This is the most amazing region of the Milky Way, and is worth the trip south of the equator just to see, by lying back and looking up. You can easily see we live in a vast Galaxy, and not in the centre, but off to one side looking back at the core glowing overhead. • and the naked eye view of the Galaxy with its centre overhead and its arms across the sky from horizon to horizon. I’ve checked off two this year! One more to go in August! Thanks for sharing – spectacular image! !